Hey Guys made an another idea for a keyblade. what do you guys think? looks like a pretty cool design, I like the colors a lot, but it's waaaaay too short. Good Keyblade for Ven maybe, aren't his usually shorter, since he hold them backhand? It's conceptually quite authentic and I always appreciate drawing skills because I have none but I see this being one of those keyblades no one really uses like Sweet Memories and Monochrome. The design is one of those clunky ones like BBS's Short Stack or DDD's Ocean's Rage. The record isn't a believable blade and I don't see the necessity of Scrump the doll. I do, however, love the idea of a Lilo and Stitch keyblade. Not really. His original Wayward Wind his his shortest keyblade. Treasure Trove was somewhat the same length as Wayward Wing but all three of the Wayfinder trio received that one and I could swear that it looked longer in Terra's hand than in Ven's, as though it adapts to its wielder. That's what I meant, when compared to Aqua or Terra's versions of the same Keyblade, Ven's is usually shorter than theirs, while Terra's is usually the longest, as it's all about their personal playstyles. Terra's are longer because he has the reach and strength for his rock solid (Pun intended) style, while Aqua's is average because she uses magic more, and Ven's is shorter because he's all about speed, getting in quickly and dealing rapid damage. 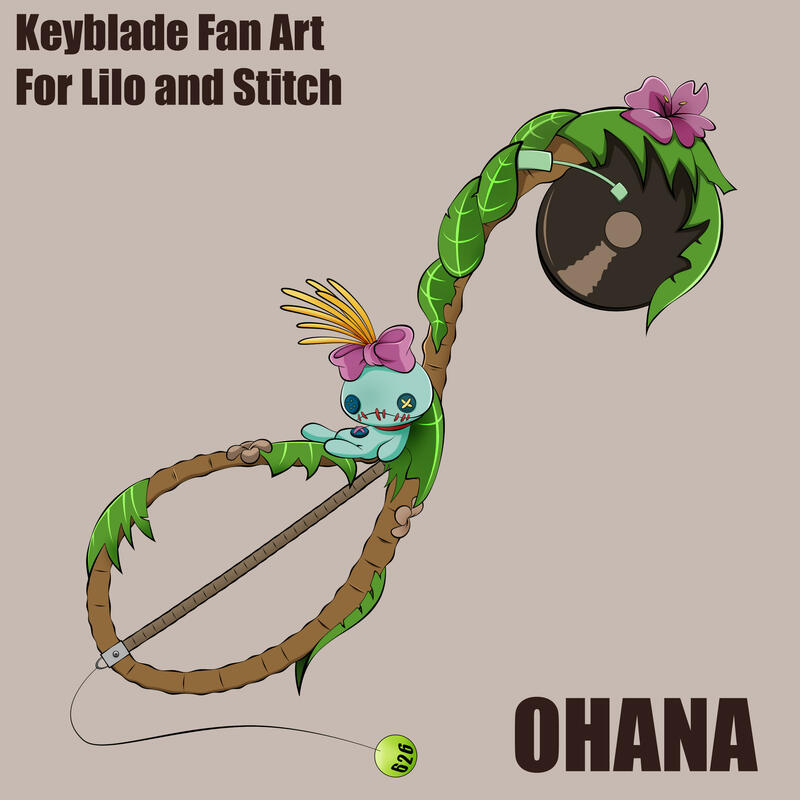 Wow, I have to say that this is an amazing fan art for a Lilo And Stitch Keyblade, and I love the name Ohana! OHANA MEANS FAMILY! And family means nobody gets left behind, or forgotten!